Marietta Eye Clinic is truly a full-service ophthalmology practice in Marietta, Georgia, that can meet your changing vision needs throughout your life cycle. Our entire team adheres to certain standards to ensure that every patient receives the best quality care and superb vision results. We only approve patients for procedures if we are certain they are good candidates. From LASIK to cataract surgery to BOTOX® Cosmetic, our doctors fully examine each patient to ensure they are suited for the procedure they desire. If not, we may recommend alternative treatments or procedures to achieve the same results in a safer manner. We continually research new technologies. 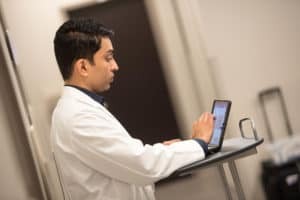 We perform our own assessment of new technologies or techniques to make sure they are producing the highest quality results before offering those to our patients. We give our patients time and information. You will never feel rushed to make a decision about your eye or cosmetic care with us. These are major decision, so we will provide you with detailed education so you can make your decision on your own time. We consult with each other. Because we have such a vast team of vision experts, we have the in-house capability to discuss special cases with each other to ensure the best possible vision outcomes. This team approach is what sets us apart from smaller practices. We know how to care for different patient ages. From children to older adults, our specialists understand the challenges associated with caring for these different patient populations. For example, children may be scared about seeing an eye doctor; our team makes these visits fun. And older adults may be experiencing multiple complicated vision problems; we can often help correct those problems with just a single treatment. We encourage you to stop in to meet our team in person. Schedule an eye exam today to see what makes Marietta Eye Clinic different from all the rest!